In the 1970s, the USMC standardized the employment and use of scout snipers as a core part of their war doctrine and they created their permanent sniper schools at that time. In the 1980s the US Army followed suit and started their own Sniper School at Ft. Benning and included snipers as a permanent part of their organization charts. The United States Air Force was a bit slower because the role and use of snipers was not nearly as defined for the USAF. Eventually the need became apparent and they began their own unique sniper program to fit their own needs. 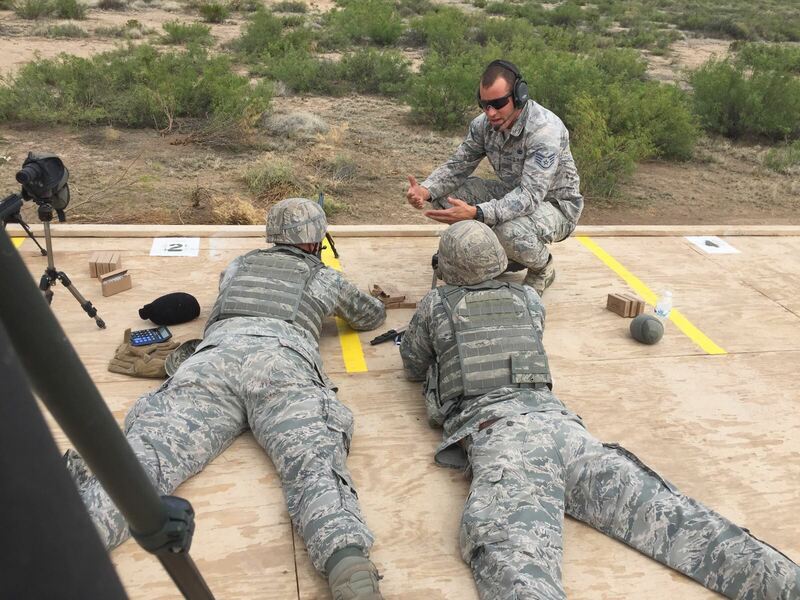 Beginning in the mid 1990’s the Air Force began training their Sharpshooters at the Air Force Counter Sniper School at Camp Joseph T. Robinson in Arkansas, an Army National Guard facility. During those early years the training closely mirrored the Army’s sniper curriculum that was then in use. In 2008 the USAF broke off from the Army curriculum and doctrine and moved their school out of Arkansas to Ft Bliss, near El Paso TX and changed the name from the Counter Sniper School to the Close Precision Engagement Course (CPEC). Also, at about the same time the Advanced Designated Marksman (ADM) course was introduced to bridge the gap between the M4 toting Designate Marksman (DM) and the more sniper focused CPEC. Eventually the ADM Course became the precursor to the Air Forces advanced CPEC training. In 2017 the USAF again decided to update their sniping doctrine and decided to do away with CPEC and focus their efforts on the ADM role. While it was disappointing for us to learn that the USAF no longer has the traditional sniper school (CPEC), this change does allow them to focus on a role more specific to the needs of Base Law Enforcement and Air Base Defense which is the primary duty of snipers within the USAF. With the elimination of the CPEC, ADM will now see some changes to the initial and re-certification training and qualifications as the best aspects of both the CPEC and ADM courses are combined and new disciplines introduced. Attendees of ADM are primarily Airmen in the USAF Security Forces of the rank E3 (Airman 1st Class) to E6 (Technical Sergeant). E7 Master Sergeants can be approved with a waiver from the school. 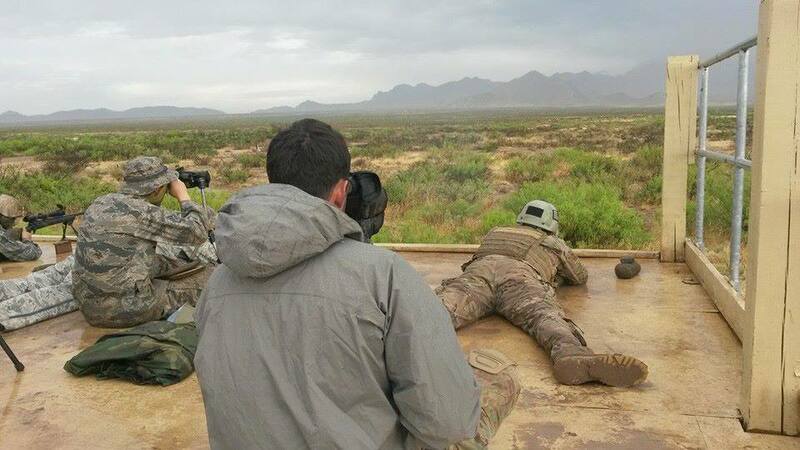 From time to time Army Special Operations Forces and US Border Patrol BORTAC will attend the ADM training as well, rubbing shoulders with the USAF Airmen. USAF Advanced Designated Marksmen are a two-person team in the traditional role of sniper and spotter and they have the responsibility of protecting flight lines, acting as over-watch for Entry Control Points and sensitive Security Forces operations in a Tactical Response Force (TRF) role, Law Enforcement Emergency Services Teams (EST), and aid in base exterior reconnaissance for Security Forces performing duties outside the wire. It is not uncommon for them to be attached to sister service sniper units as mission requirements dictate. The ADM/Sniper is armed with the M24 SWS with the Leupold MK4 10x40mm M3A scope. The spotter is typically armed with a M4 topped with a Trijicon 4×32 ACOG and M203 40mm grenade launcher, though this load-out can change if the mission dictates. Additionally, like any traditional sniper team, they are loaded down with a ruck full of additional gear and equipment, usually amounting to about 60 lbs each. The Advanced Designated Markman course is 11 days of intense classroom and practical weapons training. 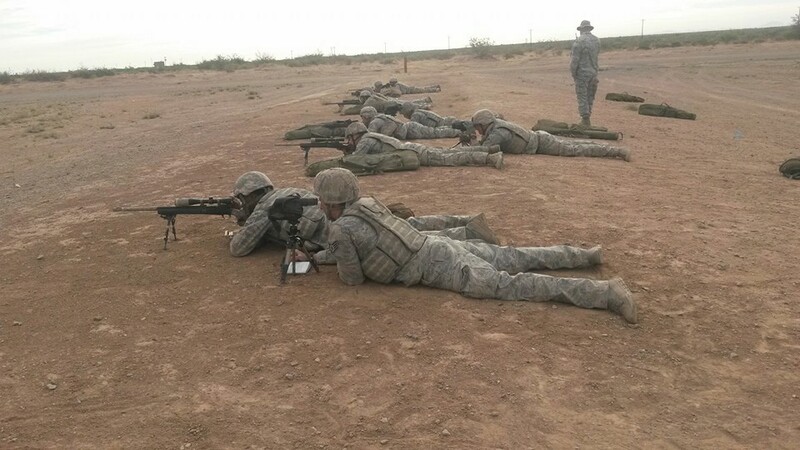 In this short period of time Security Forces are trained in advanced marksmanship skills that not only encompass known distance and unknown distance target engagements, but also the theories behind them. Classes include weapon and equipment familiarization, in-depth fundamentals, data books, ballistics, wind reading and weather effects, range estimation for unknown distance targets, moving targets, hold overs, target detection and selection, night vision and counter sniper operations. Most of the classroom material is covered in the first two days of training but there are a few additional classes that are mixed in throughout the duration of the course. After the first two days of classroom, the next 8 days are spent on the range. Teams spend 12 or more hours a day gathering their known distance data, documenting every shot fired in their data books. This period also includes practicing and qualifying for several different qualification phases. Each phase has minimum requirements for various targets and distances. Throughout the qualification phases, if the requirements are not met the member is dismissed from the course, and the lone team member is paired up with another shooter or absorbed by another team. Known distance targets include: 2″ T-Boxes at 100 yards with a 5 second exposure. 4″ circles at 200 yards with a 5 second exposure. 10″ x 40″ trimmed down “E” Silhouette moving targets at 300 and 400 yards with a 10 second exposure, and 20″ x 40″ standard “E” Silhouette Snaps or Pop ups at 500 yards with 5 second exposures. Once the member qualifies on known distance engagements the teams move onto the most challenging portion of their training which is unknown distance. Here teams use their Mil-dot reticles to range and then engage half and full-size steel silhouette targets randomly placed from 100 – 800 yards. The final qualification for unknown distance engagements is 10 targets with two engagements each. The total allotted time for all 20 engagements is 20 minutes. The instructor will call out a random target by number and the shooter and spotter must locate the target, Mil it for range estimation calculations, formulate the range, dial in the correct elevation and wind adjustments, and then engage the target twice before they can move on to the next target. Minimum qualification is 14 out of 20, or 70%. 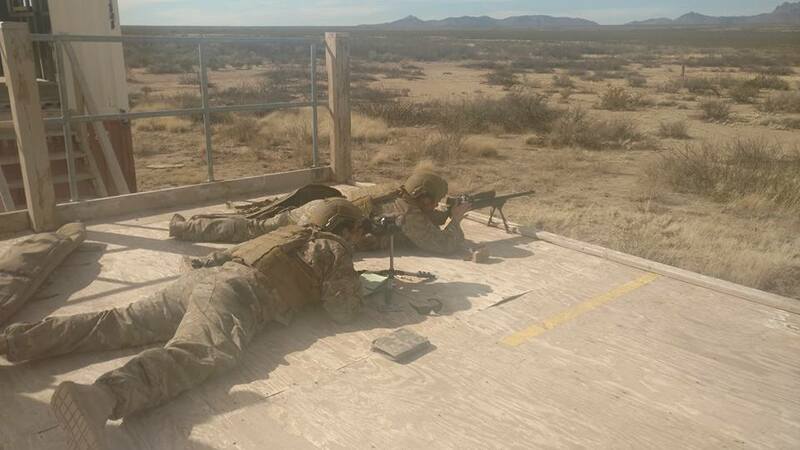 A unique factor to the ADM course is that the shooters and spotters are required to train wearing full body armor including ballistic plates and helmets which weigh in at about 20 lbs. The use of body armor and additional combat gear is nothing new for Security Forces members as it is an everyday requirement when performing their obligatory duties. Usually, when one imagines snipers, they mentally picture them wearing boonie caps and ghillie suits crawling in the mud or hiding in the bushes. This just shows how the evolution and mission of snipers has changed as a whole and specifically for the USAF. Things have changed from the jungles of Vietnam in the 1960s to the streets of Iraq and Afghanistan today. Most of today’s USAF missions require the sniper to deploy in their full kit rather than just their BDU’s and their ghillie in their ruck, so the ADM course emphasizes training how you fight. This evolution of body armor use with snipers has spread across all branches of the military as well, though perhaps not to this extent. Being wrapped in 20-45 lbs of combat gear that not only hinders the shooters movement but adds additional strain to the body, makes the shooting and spotting position’s even more difficult to maintain. The one major missing element from the school, and the one that allows it to be shortened in time compared to the other branches sniper schools, is the fieldcraft training. There is no training provided in stalking, hide site selection and construction, or ghillie suit construction and use. But with the unique role of the sniper within the USAF where they act primarily as a DM, it is perfectly reasonable to not have these topics taught in the course. Upon completion of the ADM course the USAF Sniper’s training does not end. Sustainment training becomes a regular and important part of their quarterly training and semi-annual qualifications. The sustainment training is run at the unit level with oversight of USAF Combat Arms personnel to ensure Snipers are compliant with AF regulations. Training includes classroom work combined with practical shooting and qualification. Since there are some limitations to the range and facilities at each base that is being utilized for sustainment training, there is some variance from the initial training received at the ADM course. At a minimum, shooters are required to confirm zero and meet the engagement and time standards on the qualification phases. Qualification includes known and unknown distances engagements, rapid fire engagements at targets of random distances and a night fire. In 2014 I had the opportunity to attend the ADM Course. Through my 20 years of service in the USAF I had the tremendous opportunity to attend several advanced courses instructed by both military and civilian schools including many combat arms and SWAT qualification courses. I consider the ADM course as one of the best. I found the instructors to be extremely knowledgeable and professional. There was an immense amount of information taught in a short period of time, but the instructors ensured the students understood the difficult concepts that were new to many of them. Much of this training is best understood when applied on the range and there was always an instructor at hand that could clarify and assist if necessary. I found the courses of fire to be challenging but certainly attainable with proper coaching and the help of a good spotter, and I was lucky, I had a great spotter. I fell in love with the M24 SWS. It functioned without any issues and was dang accurate when I did my part. My Mk4 10x40mm scope was certainly durable and functioned very well minus a little stiffness in the windage knob. Most importantly it tracked accurately which says a lot for its durability. Who can say how many firing solutions had been dialed into that scope in its many years of service. Though the Mk4 fixed 10x power scope is certainly capable, there were times I would have appreciated a variable scope with a little more magnification. So how do USAF Snipers rank with their peers? I personally hold them in high regard but I am a little biased. Those I have known and worked with have a great respect for their job and responsibilities, and work hard to not only stay proficient with their skills but to continue to progress in their field of expertise. The USAF certainly produces excellent snipers. In fact in 2017 SSgt Colton Schoenegge and SSgt Jordan Whitlock of the 620th GCTS placed 8th of 29 military and law enforcement teams from around the world at the International Sniper Competition held at Ft. Benning Georgia. This event is one of the most prestigious events of its kind as teams are tested in all the traditional skills such as marksmanship, stalking, target detection and other disciplines over a four-day period. It’s an outstanding accomplishment if you ask me and says a lot about the capabilities of Air Force Snipers! Great article on these seldom covered airmen! I had the privilege of attending this school in the early 2000’s and returning to my unit in order to train others and do my job much better. We had army sniper school instructors and air force counter sniper instructors running us through the rigors. The attrition rate was right around 50% for my class. In those early days there was no AFSC identifier that would make us official counter snipers or designated marksman. Once back to our units there were no precision rifles for us to continue to train with so we just did the best we could with the equipment we had. We bought optics for our M16A2 and enhanced our mission based on our new knowledge and training. Even on overseas deployments there were no M-24’s for us. Regardless, we were able to provide more effective overwatch for tent cities, entry control points, vehicle search areas, restricted areas and whatever else we were tasked with. Its a great concept to train airmen in this discipline. Our pleasure, glad you liked the article.